Every time I site plants, I hope I put them in the right spot. Over time, some plants die, others gradually shift their location. Over the last few years, I tried an experiment to see how the garden would manage itself with a minimum of intervention. 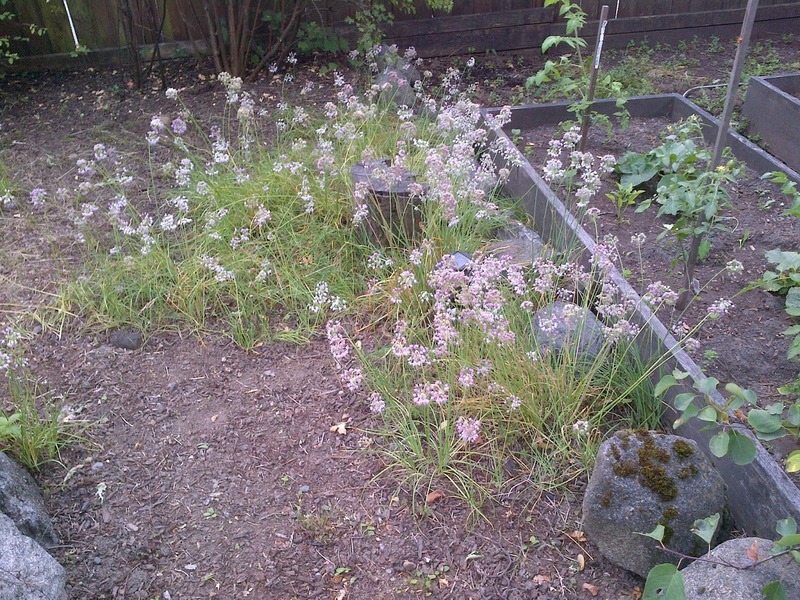 It was also to test the philosophy of wild vs. domesticated and to find the right balance for this garden. Not surprisingly, the experiment had mixed results. My photo collection is riddled with plants that did not make it. Other plants thrived where they were planted, while yet others moved themselves around, especially apparent from the nodding onion and the blue-eyed grass. 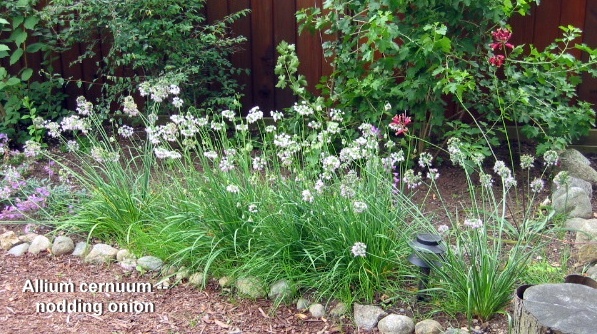 In 2005, Allium cernuum was planted in a nice, neat row in front of the back bed at the edge of a path demarcated by rocks. The row was thick and full. 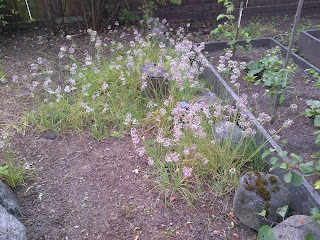 But were the nodding onion happy? Not quite. Allium loves sun, and the shade from the fence and the larger shrubs was not to its liking. So it started to migrate toward the right and out into the path. By 2013 the plants had shifted quite a bit to the right and along the vegetable garden as well as up into the rocks of the rock garden. It had got sparse off to the left. And by last year, relentless strawberry had wormed its way in, too much turf grass was still growing, and the nodding onion itself had become a patchwork. In the process of labelling each of my photos through the years, I looked at some of the older photos and realized I missed some of that order. Not all of it. I still want the plants to find their best spot if I haven't done so already. I still want the strongest to survive. 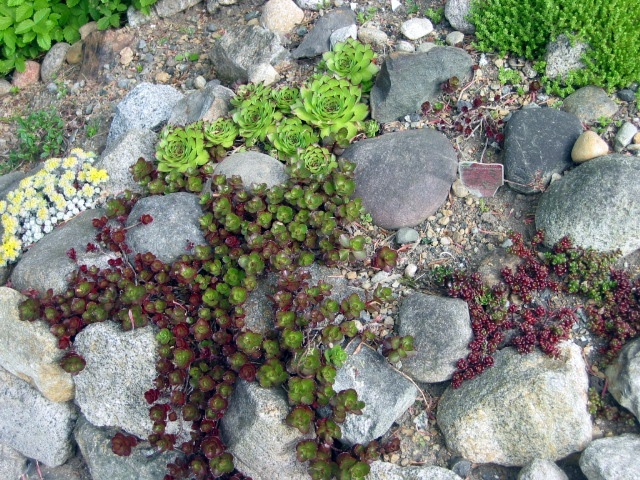 The place where I missed order the most was the rock garden, which is a mix of native and non-native. The idea was to create a feature lacking in the yard while hiding rocks and asphalt chunks beneath the worst of the soil covered with more rocks. It started life fairly well constructed, with one small sheer wall and several sloping walls. 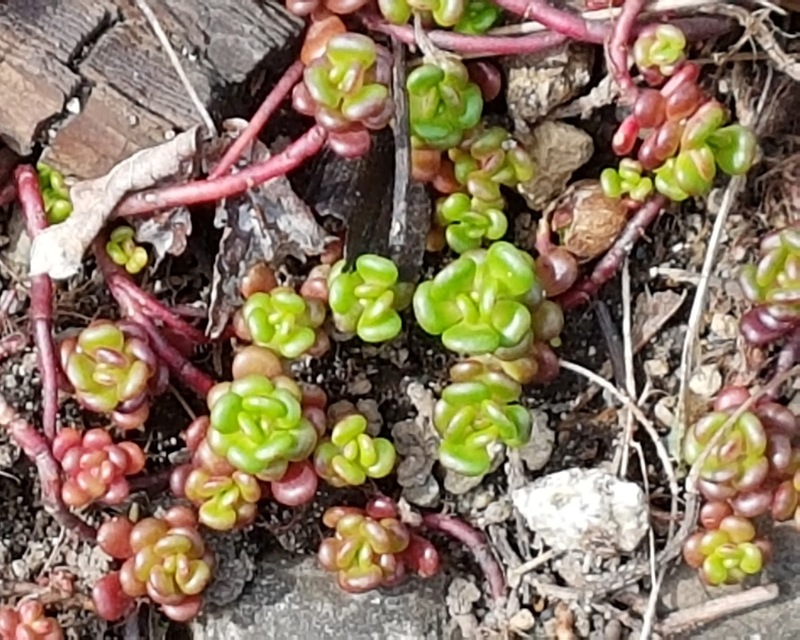 There was a variety of succulents on the sunny side, two kinds of mountain avens in either direction, a mass of strawberries over the top of the shadier side, and violets tucked into the shadiest, moistest spot on the backside. So much has changed on this feature. Rocks have slid and fallen. Soil has eroded. Weed extraction (there was a particularly nasty infestation of something) took a toll. And some plants just didn't make it: all those hens and chicks above, yellow mountain avens to the left, and some purple violets that were overtaken by yellow ones. I got into rehabilitation mode. 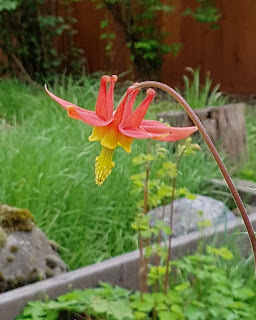 It's too soon to do too much, but I am reestablishing some boundaries and working to ensure that strawberry and white mountain avens don't crowd other things out and that nodding onion does not climb up from below. I need to give these little things a chance! I'm also trying one last time to see if I can get Penstemon pinifolius to thrive by moving it to the top of the mound. It should live in a desert. That's where I fell in love with its scruffy foliage and thin red flowers. But I haven't seen those flowers in a while. Here's hoping I have found a way to make it happier. Unlike some of the other penstemons, it hasn't died yet. There's still hope!